Summer is in the air! 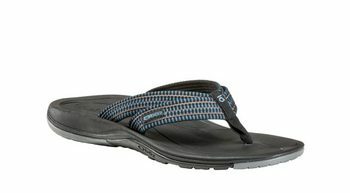 Oboz Men's Selway Flip is ideal for any warm weather activity. We all have our reasons for flip-flops: poaching resort pool showers, airing out the funk back at the trailhead, or flipping the proverbial bird to your GF’s stuffy old-money friends and letting the piggies fly free. But just in case you have to sprint away from that rent-a-cop, we put carbon rubber pods on the outsole, springy EVA in the midsole, and give it the same supportive shape as our O FIT Insole™.